Thanks for visiting our News and Events page. Here you will find the latest information about upcoming shows, magazine articles, gallery openings, and so forth. I will also try to keep you posted about our most recent photo trips and the newest images. 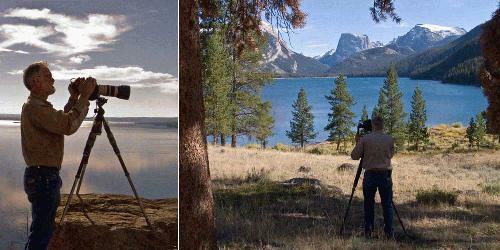 I may also share with you some images taken during those trips like the one to the left. 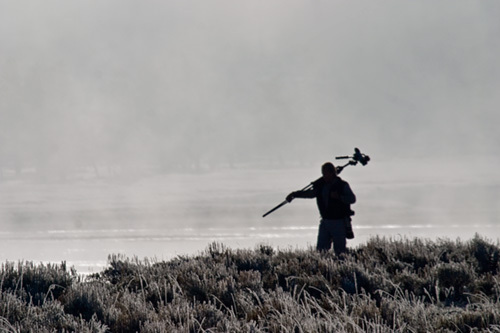 This image was made by my good friend Larry Roop on last year's winter trip to Yellowstone. 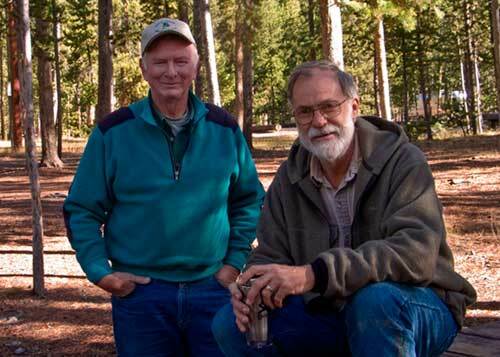 Larry and I spent many years together trapping Grizzly Bears in the greater Yellowstone ecosystem. They were wonderful times. This image was made along Soda Butte Creek near Ice Box Canyon. I spent a good part of that day in waist deep snow and made some great winter images from that trip. Check back on this page often for more news, but I'd highly recommend that if you would like to be notified of new additions and specials associated with 'Images of Wyoming' to go to the website and sign up for our opt-in newsletter. It's easy to do with just two mouse clicks and a verification email. It will be sent out on newsworthy occasions only and I promise not to clutter up your mailbox with any junk. In addition, you can subscribe to my new blog. Click on the link to the left in the navigation bar that says Read My Blog. There you can sign up for email updates by entering your email address in the Feedblitz link just below my picture. Then as I update the blog, you will be sent an email notification. It is an easy and painless way to keep current. For now I hope you enjoy browsing our site and seeing images of our favorite place, and again. Welcome! I've been planning for something special for you who follow my work. I'm in the final stages of getting some audio recordings about things I've done in my photo career that I think will be of interest to many of you. I've hinted about what some of the initial content will be in my blog. If you have not subscribed to the blog, you can do so easily by clicking on the link that subscribes you to an email notification only when new changes are made. You will receive no spam mail or other communications from me, just a simple notification that there is something new for you to read. You will only have to verify your desire to get these emails and it is all done. EASY! Keep watching in the next couple of weeks for these additions. 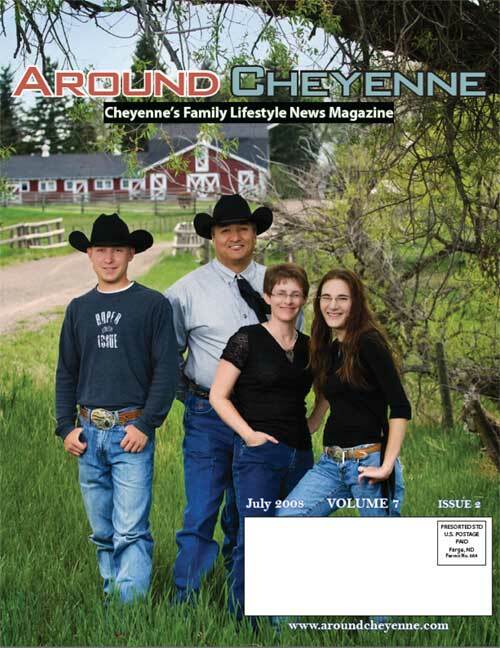 The July issue of Around Cheyenne featured a two-page spread about me and my work. The release of the article was to be in conjunction with the opening reception at Deselms Fine Art Gallery on July 12th, but due to some unforeseen printing problems the release date was delayed. On July 10th the Wyoming Tribune Eagle published a story about me and my work in conjunction with the gallery opening at Deselms Original Fine Art Gallery in Cheyenne, WY. The story gives some insight into my background as a photographer, the motivations for my work and a little bit about the size of the panorama work. The editor ran several images of the panoramas that are now showing at the gallery annex at 124 W. Lincolnway. The story is reproduced here for those of you that were unable to read the newspaper on that day. My thanks to them. Just click on this link to download the entire newspaper article. Enjoy! Reprinted from the archives of the Wyoming Tribune-Eagle by permission of Cheyenne Newspapers, Inc. Copyright 2008. All rights reserved. 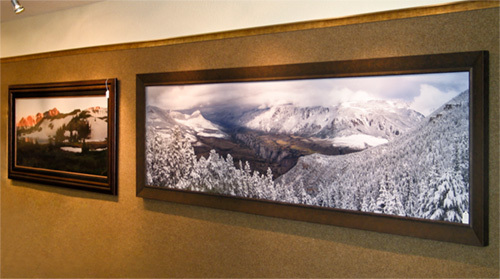 FrameMasters has just added a few new panorama images to their growing selection of Jerry Geist photographs. 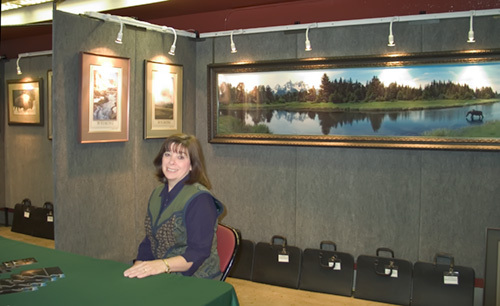 In celebration of the new shop and showroom at 137 Kornegay Ct. in Cheyenne, WY., Myra Jolly, the owner has custon framed two large panoramas from Jerry's collection. Shown here is one of the 7' wide pictures he took in October of 2007 in the Clarks Fork Canyon country of northwestern Wyoming. The second image is a 6'6" tall vertical panorama of Granite Creek in the Bighorn Mountains. This striking image was made in the early spring during a snowstorm. The trees are frosted and new spring foliage is peeking out from the blanket of white frost in a heavy fog. It is a dynamic image. Both of these new images plus several wildlife portraits and two other panorama images are also on display in the gallery. Stop by and take a look at Framemasters new shop and these very special, original panorama images by Jerry Geist. CBS News Channel 5 film crew visited Deselms Fine Art Gallery to film some of the large format panorama images that will be in the art show called Panorama Images of Wyoming by photographer Jerry W. Geist, for the opening day reception July 12th, 2008 from noon to four pm. The interview will be aired on the morning show on July 10th and will be hosted by Ann Lauricello of KGWN-TV and Annie Wood, marketing specialist with the Wyoming Made program of the Wyoming Business Council. Get up early and flip on TV channel 5 to see what they have to say about the images that will be displayed in the show. If you cannot come to visit us at the gallery on the opening day, please stop by and take a look at the display throughout the summer, then drop us a note at Images of Wyoming and tell us what you think about the panoramas. In conjunction with this News and Events page, we've put the finishing touches on our new blog called Images of Wyoming. On the blog you will find content related to Wyoming and photography, but not the same material you will find on this website. I will share with you some personal insights about my work, favorite places, equipment, and a wide range of experiences in my 38 years as a professional photographer. At the beginning my posts my be at irregular intervals, but I will try my best to share with you interesting facts and stories that will enhance your knowledge of me, what inspires me and how I like to work. Subscribe to a feed for regular notices of changes to the blog. It will make keeping up with the latest information a whole lot easier. Enjoy and please feel free to make some comments. I'd love to hear from you. 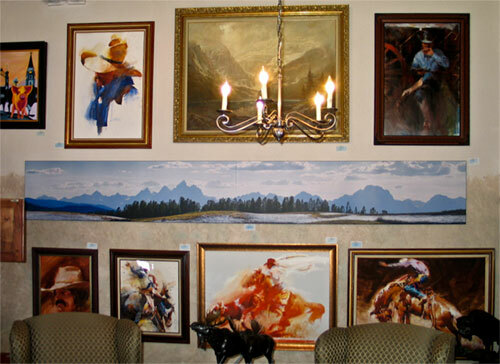 Visit our blog at http://imagesofwyoming.blogspot.com. In 1996 I made my first large format panorama print, an eight foot wide limited-edition print called 'The Teton / Snake River Panorama'. The print was made from 12 film originals and it took me nearly 4 weeks to perfect the print using Adobe Photoshop 4. I learned much in those early days, but the most significant thing that came from making that first print was a new vision for my work. I was hooked not only on the format but the sheer print size that made you feel like you could almost step into the scene. Since that first print, technology has improved by leaps and bounds and so have the scope of my images. What used to be a very large panorama has taken back seat to images I'm making now that have exceeded 30" high by over 45 feet wide. The computer equipment I use is something akin to a mini-supercomputer and files sizes have exceeded 8 gigabytes. Panorama prints of Wyoming have become my specialty. Pictured here is one of my 'smaller' large prints, a 16 foot print that was displayed at the heritage expo in Casper last year. Look on the wall behind the print and you will see my original 8' limited-edition print. This 16 foot print now hangs in a home in Washington state. For the home or business that has the space, these very unique prints create an environment you almost feel like you can step into. They now adorn such places as the University of Wyoming Foundation, Ivinson Memorial Hospital, several doctor's offices, an operating room, and homes in far away places like London, England. Though not online yet, eventually they will reside on the www.wyomingpanorama.com website which is now dedicated to just the limited-edition print. If you are interested in large panoramas of Wyoming, send me a note and I'll be glad to show you other images or direct you to places where you can see them for yourself. Enjoy! We're excited to be showing some of our large panorama prints at Deselms' new downtown gallery at 124 W. Lincolnway, across from Depot Square. 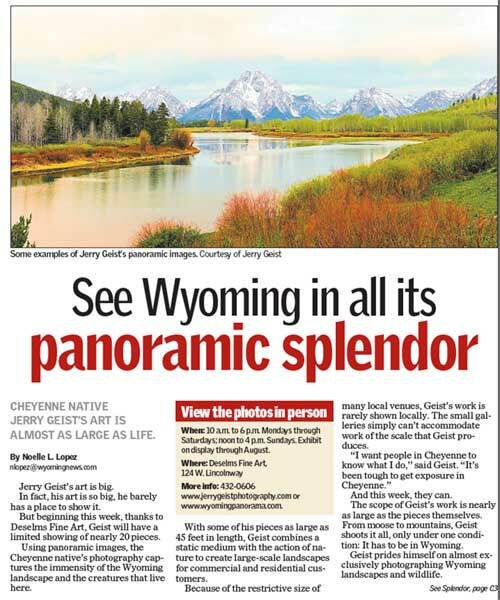 Harvey has given us a very large space for some of the large panorama images of Wyoming. We've been very busy getting images printed and hung for a gallery opening day reception scheduled for July 12th from noon to four pm. If you are able I'd love to have you stop by and see some of these special images; be sure to introduce yourself. I'll be there to talk with you and I hope to have some of the other proof sheets of nearly a hundred panoramas that I have completed to date. We will have 10 large panorama prints on display including the limited-edition 'Teton / Snake River Panorama'. Other panorama prints will include the Tetons, Chimney Rock, Tensleep Canyon, Vedauwoo, Yellowstone in Winter, Snowy Range, a vertical panorama of a waterfall in the Beartooth Mountains and a closeup of an Aspen Forest to name a few. In addition to the other panoramas, Harvey and I selected a large two section panorama of the Tetons shown in the picture to the left. This print measures 20" X 12 feet wide. Compare to the other prints that surround it for a little perspective. Harvey has also chosen to display some of my standard size prints, two of which are past winners in the Southeast Wyoming Art Show. These selections are just a few of the 925 images found in the galleries of my website. Of course space is a major limitation at a gallery so come take a look at what prints look like in their final sizes, then if you are interested in other subjects, spend some time looking over the large selection online. 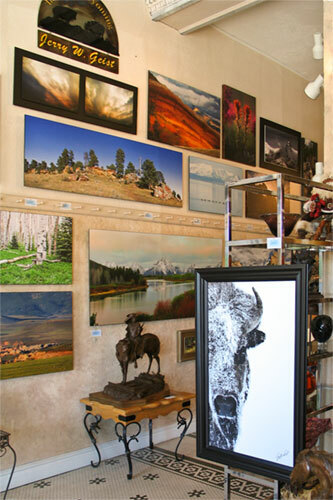 I hope to see you at the gallery opening on July 12th, but also watch for a two page article about me and my work in the Around Cheyenne magazine - July issue. There will also be a television spot on KGWN done by the Wyoming Business Council on the morning of July 10th. We're excited to be showing our work in our own hometown and hope to meet many new friends. Please come by to introduce yourself to me or send me a note if you'd like to talk Wyoming and especially panorama prints of this magnificent place. Hope to see you soon. I truly enjoy my work making my multi-image panoramas on the computer and seeing the final results in print, but my hearts desire is to be out in God's creation spending time with Him and making images that reflect His glory. I'm so privileged to record the magnificent beauty He alone has created. Those are refreshing times for me, times of renewal after the sometimes long winter seasons. They are often times of special worship of my Lord. But, He has always been faithful to show me marvels of His creation that I get to interpret through my own artistic filters. That is the experience that I feel makes me a true photographic artist. I love those magic times on the 'edge of light, season and weather'. This is what I feel defines my style. When the weather is clear and bright, I find it the most boring circumstance for my best work. When the weather is foggy or stormy my spirit comes alive. Put that together with my favorite place, Yellowstone National Park and I never come away empty handed. Always looking for the dramatic! See you in the wilderness. Well, if you've read this far then you've seen my face and may have come to associate that grey bearded face with "Images of Wyoming", but I'd like you to meet the other members of our business family along with a couple of close friends who've been a part of my photographic career from the very beginning. These are significant people to me and without them, their help and encouragement I couldn't be doing my artwork. I hope you'll get to know them as well. This is my wife Marsha. She is the behind the scenes part of 'Images of Wyoming' that wears lots of hats, but gets little recognition. Without her to take care of the books, I'd probably be in lots of trouble. I still can't figure out those darn Visa charges. She does all my proofreading and editing, something she's really good at. If you find any mistakes on the site, it is just that she hasn't got to read my entries yet. Eventually she corrects everything. Most of the time I travel alone, but sometimes she gets to go along and she has been there with me when I've made some of my most significant images. That was great! She always helps set up displays and helps me pack for my trips. She says she is my mule. Not true, but without her help, I'd never get it all done. When it comes to my trips, I'd never get out of town with all I need if she wasn't riding herd on me. Marsha always takes opportunity at her work or wherever she may be to help market my work and hand out business cards. She is the pretty one at my side at shows and receptions. She adds a touch of class to my outdoor attire that even adorns me at the dressiest of times, like church. We outdoorsmen need all the class we can get. Her biggest task to date? She's still trying to get me to slow down and 'enjoy life without a camera,' but I haven't come around yet. Be sure to say Hi! to Marsha when you see her. She helps make it all work. Next is Boris. He is like a permanent attachment to me. I go absolutely nowhere without him. He knows everyone I do business with (and where they keep the treats). He is my watchdog and friend. He gets as excited at traveling as I do, loves to hang out the window and watch everything that gets me excited. He keeps me company on some of those long and lonely times away from home. His most important duty is his job as a buffalo dog. Since I spend so much time photographing these animals I have regular encounters with them. When they get unruly or stubborn, walking down the middle of the road or creating a buffalo jam, Boris will get them moving on command, otherwise he just ignores them. He has come to my aide on several occasions, much to the surprise of those with me. You will rarely see me without Boris close at hand. 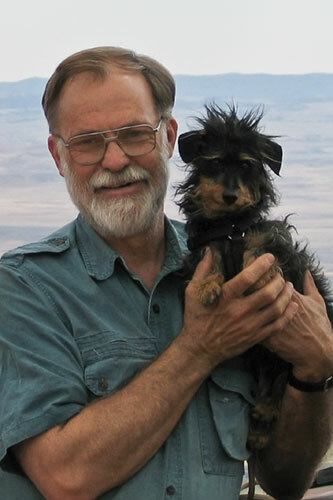 If you've looked at my site and read any of the print descriptions, you've come across references to Larry Roop. We've known each other for over 38 years and he has been a significant part of my photographic career. Several of my images were published when Larry was associate editor of Wyoming Wildlife magazine. When he moved to Cody, he became the state Grizzly Bear Biologist. That afforded me lots of opportunities over many years trapping Grizz'. 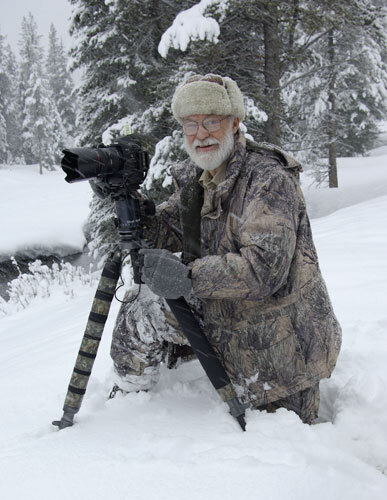 He even contacted me to do a photo story for National Geographic about his work that was taking place at the height of the Craighead's work with bears in the greater Yellowstone ecosystem. I still have some of those images that survived a fire and they are special to me. His assistant, Bart Slyer, was with us on most of those trips and we had some wonderful times. Unfortunately, Bart was killed by a bear in the Yukon while bow hunting for moose. I hope to share some of my images with you in future postings. They were good times. Since Larry has retired we've had time to make some trips together remembering the good ol' days. The picture of me in the snow in Yellowstone was made by Larry. There are many stories to share about our time together. He continues to be a significant friend in these years of my photographic work. 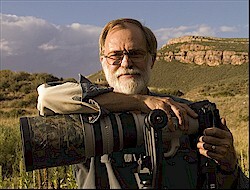 Another long-time photographic friend of mine is Greg Hallen. We've known each other for 32 years. I first met Greg when he came into the photo store I managed. Quickly, we discovered that we had a common passion for medium format photography and darkroom work. At that time Greg was a missile launch officer in the USAF. I kept him in constant supply of every kind of developer and paper that came on the market and together we tested and tried most every combination imaginable, trying to get the very best quality from our negatives and prints. That passion continued for years. 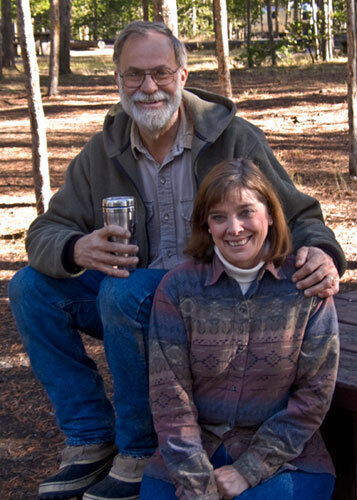 Greg and I were founders of a photo group called the High Plains Photo Group. It was formed to support those who had a true passion for the craft of fine B&W photography, rather than the casual enthusiasts. It only lasted for a couple of years, but our passion for quality photography continues to this day. Greg is now the video section supervisor for the Wyoming Game and Fish Department. Greg continues to do fine B&W photography, and I've known no other person in all my career that I would call a fanatical perfectionist. His work is truly superb, though he doesn't do as much as in years past. 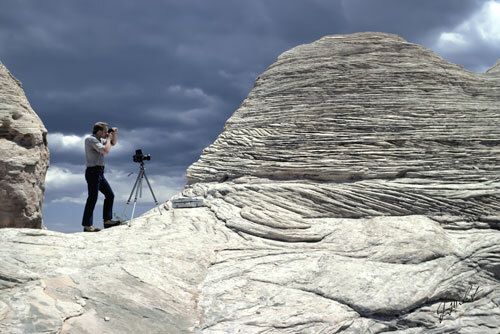 The picture I'm sharing with you was taken when Greg and I were making images in some wonderful badland country near Chimney Rock. We made some great images that day and this image holds a special memory for me. He continues to support me at art shows or when he is photographing the Wyoming Heritage Expo in Casper each year. I still drop by his office to just chat about photography and hear his latest diatribes about new lenses, light sources, developers or papers he is studying. He keeps me sharp. Greg is my friend and I'm glad to introduce you to him. The Outdoor Heritage Expo held in September of each year has been a significant place for us to showcase some of our latest work. 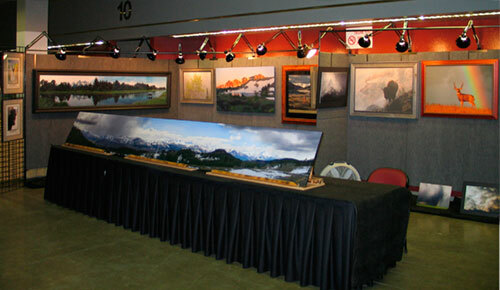 Our first year we displayed the eight foot limited-edition print called 'The Teton / Snake River Panorama.' You can see it here behind the lovely lady attending the display. That's my bride Marsha. The following year our display area doubled in size to accommodate an even larger panorama print that measured sixteen feet wide. That picture garnered lots of comments and attention, but now we have prints that are measuring up to 30 feet wide and one I'm finishing that is over 45 feet wide by 30" high. I don't know if they could find the space for that image. Unfortunately, we will not be able to attend for the 2008 year, but hope to be back in 2009. It is great place to meet lots of folks from all over Wyoming and surrounding areas.